It’s going to be a short post today, for various reasons, some good, some bad. The bad is I have a stinking cold. I spent the afternoon trying to rest because I had dinner plans for my bi-annual catch up with my old work friends. The good is that I made it to dinner and spent a lovely two hours with good food and good company, catching up on the work gossip and not talking about the children (much). It’s hard not talking about the kids but it is sort of an unspoken rule that we don’t, even though five out of six of us have children and the sixth has a puppy that is just as troublesome and gorgeous. It’s actually rather lovely to forget you’re a parent for the night. I think parenting can be a divisive rather than inclusive subject for discussion. Everyone has different techniques and priorities, and there’s such a difference between age stages, from a baby to a pre-teen, as the age range is across our group. Plus the passing of the years are more noticeable when we talk about such and such starting school or big school. Without the kids to mark time, it only feels like yesterday that I left work rather than six years ago. Work is always a safe topic. Even though two of us haven’t worked for the company in years, it’s still possible to follow along. Like an old school friend you haven’t seen in a decade, you can still talk about that shared experience. 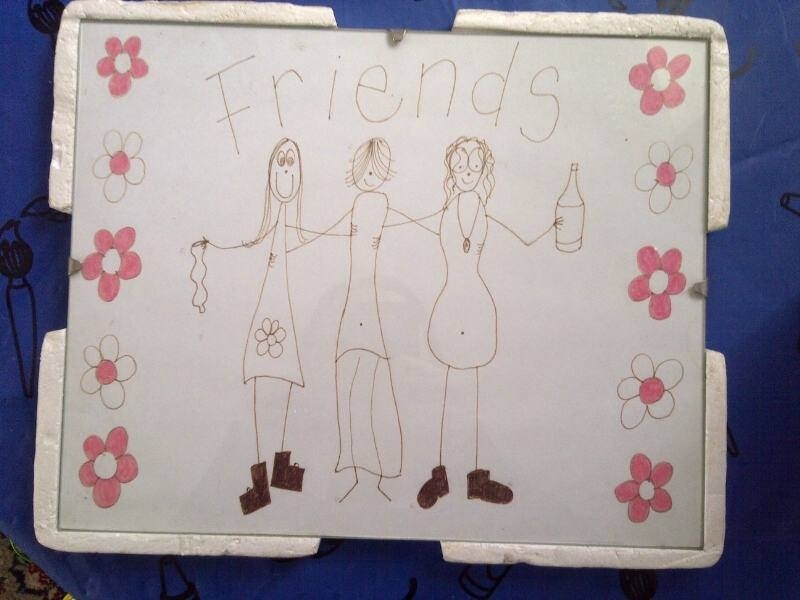 Incidentally the picture is one I drew of me and my two best friends at high school (a scary 20 years ago). The friend I gave it to emailed me a copy this evening, after finding it in a drawer. Happy days. So, it’s off to bed for me, with the intention of writing my Claire instalment in the morning, after I’ve painted a shark. It’s been a lovely evening and I want to round it off curled up in bed with a lemsip, finishing Reckless Rebellion by Rinelle Grey (published on Amazon today!) Night night. Claire looked out the window at the changing scenery and wondered if she’d make a mistake. It felt lonely knowing that Bethan wasn’t on the bus. I would have had to say goodbye in a few days anyway. Travelling is all about meeting people and then saying goodbye to them, carrying them with us in our hearts. She smiled at how corny that sounded, although no less true for all that. Bethan had begged her to stay in Queenstown for the extra day, but Claire felt no pull to stay in the famous town. Despite the lure of luging and drinking and other activities, she wanted to get on and get home. I guess I could have missed out the bottom bus completely, but I really want to see the sea lions. The brochure said she could do a wildlife tour in Dunedin and that had been enough to persuade her. Bethan hadn’t understood that she’d rather do that than drink shots out of tea pots. I’m surprised too. I must be getting old. She turned her attention back to the view, as the bus pulled into a town. She guessed it must be Dunedin, although it was nothing like she had expected. Apart from Wellington, it was the first really hilly town she’d seen, and the buildings seemed to be made of stone rather than wood. As they drove through the streets, Claire peered out the window and felt a quickening in her tummy. It seemed familiar, as if she’d visited before in a past life. She soaked in the grey stone, the university buildings, the formal gardens and smiled. I could be in any northern British town. The bus pulled up at the bottom of what looked like a residential street. Claire wondered if they had arrived at the hostel, although it didn’t look like the centre of town, where she thought the hostel was located. The driver finished his terse announcement, got out of the bus and lit a roll-up. Claire followed all the other passengers, glad to stretch her legs. Outside it was raining, a light mizzling rain that hadn’t been noticeable as they drove through town, although it probably explained the greyness of the buildings. Claire looked up the street and wondered if she had the energy to climb it. It didn’t look too bad from the bottom, but she knew looks could be deceptive. Some eager passengers started up the hill at a run, but soon dropped to a jog and then a walk. As she climbed, Claire marvelled at the buildings, where the road started at the lower floor window and passed somewhere near the upper floor. She took some pictures and kept on climbing, ignoring the burn in her thighs and the lack of oxygen in her lungs. At last she reached the top and turned to survey the view. It was worth the climb. The road dropped like a child’s slide beneath her, a straight ribbon of tarmac. In the distance, tree covered hills hugged the little bit of town she could see. The sun had broken through the clouds on the other side of the valley, and its rays lit the fields like a spotlight. More than any place she had visited in New Zealand, the place felt welcoming; as if she belonged there. With a sigh, Claire put her camera away and headed back down to the bus. Posted on September 20, 2013 by Amanda Martin	• This entry was posted in 2013 365 Challenge, My Novels, My story, What I'm Reading, YHA Novel Two-Hundred Steps Home and tagged 2013 365 Challenge, Baldwin Street, Dunedin, Friends, Going out, Life vs Writing, New Zealand, postaday, Reckless Rebellion, Rinelle Grey, YHA Novel Two-Hundred Steps Home. Bookmark the permalink.